Knowing the best rendering strategy can save time. Although most digital video editing systems allow for multiple layers of realtime video, it is necessary to render that video at some point in your workflow. It's important to understand the best video render strategy for your needs. Whether you edit on Adobe Premiere Pro, Apple Final Cut Pro or Avid Media Composer, your video needs to be rendered, when it comes time to archive your video. Rendering allows you to contain all of the video layers in a single video stream. Since most of what I do has to get out of the system as a file at some point, I prefer to render my topmost track. 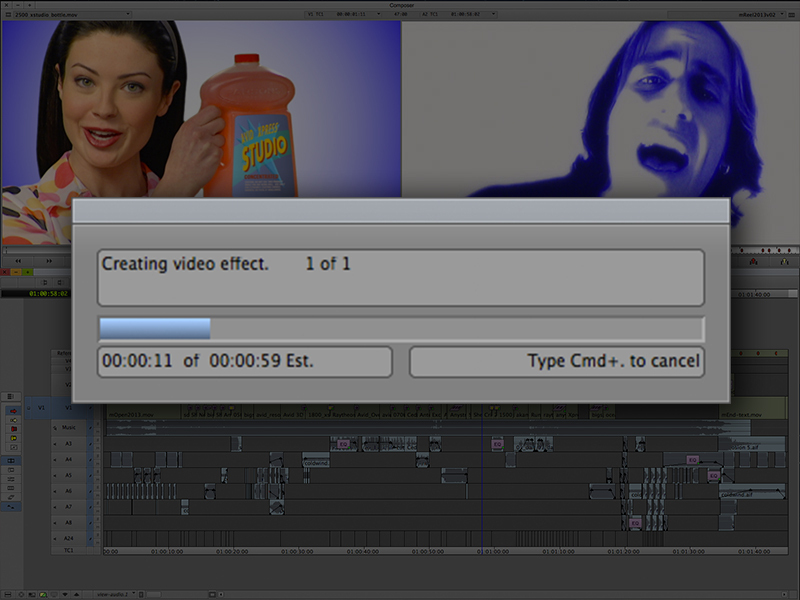 Not only does this prepare for an export, but rendering the topmost track, means the video is re-compressed only once. If I render a lower track first and then the track above it, the system has to compress the composite twice. Many choices available for export. 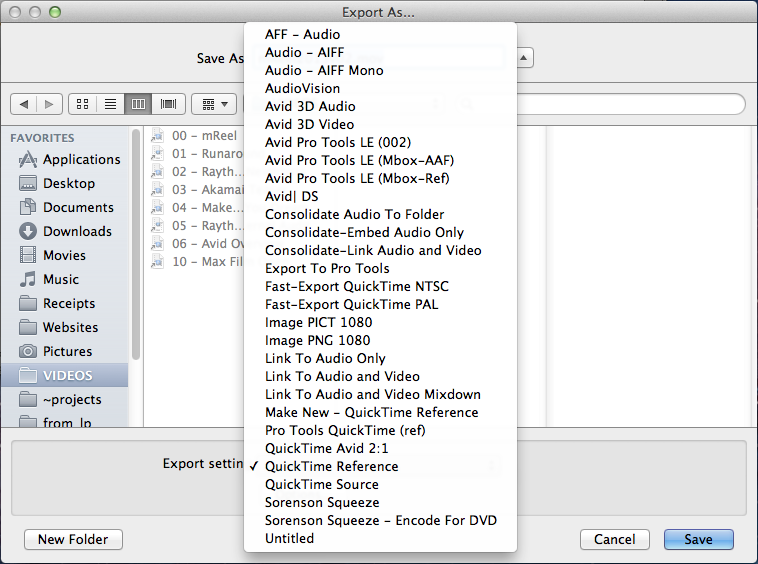 On the Avid Media Composer there are many choices for exporting your video out for archive. Your program can be saved in many different codecs and wrappers of digital video. You also have the choice to save your video in the same format as the original source, allowing you to have a saved file without any additional encoding. Whenever I need to archive a finished video program, I always export the video as a "Same As Source" Quicktime movie. If my tracks aren't already rendered, the system has to render them to the Quicktime as it goes. Technically, all export modes render on output, the difference is where they put that render. If you plan to export the video on multiple occasions, your best bet is to render the top track of the sequence first - this will eliminate more than half of the time to export out same as source. Expert Render may be fine for playback or when outputting to tape, but it doesn't help when exporting, no matter what type of export you use. Whenever I need to encode my video for review or delivery in some other video format, I always export out of the editing system as a Quicktime reference movie. This is the quickest way to get the video out in its native quality. It also lets me use software that specializes in encoding video, such as Sorenson Squeeze. 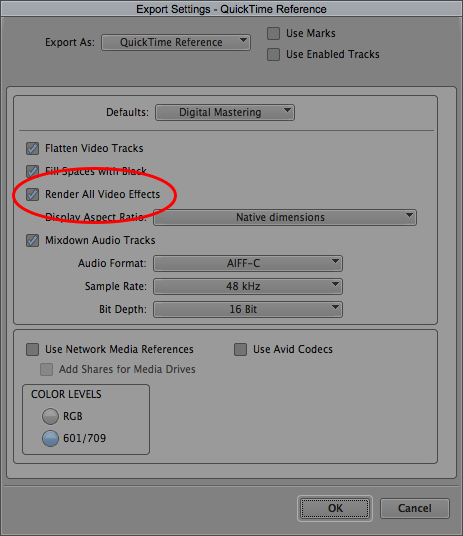 When setting up my export settings for Quicktime reference, I always have the system Render All Video Effects on export. These days, I use the "Send To..." command rather than the "Export..." command. This allows me to have retain filenames that are longer than 27 characters (more about this in the upcoming Avid Editing Tips and Tricks - Part VI). The good thing about exporting a Quicktime reference, while rendering all effects, is that it saves the renders as precomputes. This means that going forward, you are working with a rendered sequence. 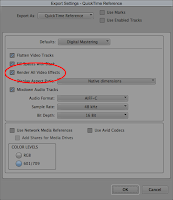 This feature is also core to the batch rendering multiple sequences tip in Avid Editing Tips and Tricks - Part V. On the other hand, if you export as "Same As Source" or some other codec, the system has to render the composite as it writes the frame to the exported file. The rendering and export strategy you choose can save a lot of time in your digital video editing workflow. Choose the strategy that works best for what you need to accomplish. Thanks for the post. Most informative!! unfortunately it doesn't work with AMA linked material !!!! Generally, if you have projects with multiple review cycles and the review copies need to be delivered in some other format, it's more time efficient to transcode your AMA media and work off that. Or maybe just jump to a modern and efficient NLE like FCP X where you'll never even SEE a render bar no matter the settings, as it should be in the 21st century. Andie, you're obviously a big fan of FCPX. Have you had the opportunity to use any other editing systems in a professional capacity? :-)))) ... you mean in my 20+ years as an editor?? Erm... yeah, actually I have. I've owned most everything under the sun and freelanced on all the rest. Stopped with Avid somewhere in the early 2000's because the timeline workflow was FAR too convoluted and tedious after learning others and even worked for Adobe for 5 years in the "Dynamic Media" dept. which included AE and PPro. I just became too embarrassed by its horrendous instability when it returned to the Mac and lack of so many basic usability feature's. Which I'm sure has changed in the meantime… but, too little too late. Premiere is the only other company to be taken even vaguely serious. Avid is factually DEAD, on a financial level alone. There's no way you could get me to waste a cent or minute on a system from a company that hasn't turned a single cent profit since **2005**(!! ), is barely worth one FIFTH what they were 2-3 years ago and has nothing in advancements to show for in an even longer period. Always trailing behind everyone else technically (64bit etc.). Merely surviving on its few die-hard users that make up 1% of the entire market at best (film and some legacy broadcast). To suggest that *FCP* of all things could disappear tomorrow, as so many like to, is just hilarious. I teach on the side when time allows and NO ONE below the age of 30 knows anything about Avid aside from maybe the name and doesn’t care. That in itself shows where it stands and is headed. The one MC that the school I work for the most has left over is *never* used. The kids hate it. With its ridiculous price, amazing ease of use, the all new media/project management of the next version and now even its "mini" version for FREE in the form of iMovie 10 (for e.g. producers/news people etc. to make first roughs) it will spread like wild fire, even before the last generation of inflexible know-it-all “pros” dies off and the new ones graduate and mature, starting next year. Mark my words. X already has more users than legacy FCP ever did. Only those users aren’t (yet) as vocal as the solipsistic “elite”. The market will be divided between X and PPro, but most certainly NOT Avid. Their arrogance killed them years ago and their financial situation clearly reflects that. It's nice to see someone with so much passion evangelizing a product. Although, you do come across as a little angry and that sometimes has the opposite effect on evangelizing. To be honest with you, I tend to form my opinion based upon personal experience and rarely go by the opinion of someone I don't know. I own a copy of FCPX and will give it a trail run when I have an appropriate project. It's a shame that with all your years of experience, you still believe that there is one system that is best for everyone's workflow. I tend to believe that with the right skills, an editor can craft a great story with any tool available. The right tools depend on how an editor likes to work - there isn't one tool that works best for everyone. I care more about the systems used by post facilities in my area, than what is preferred by a student. Does it really matter that these kids hate a system they *never* use? I'm sure that once some of those same kids work on enough professional projects, they will be able to better decide which system works best for THEIR workflow. Choosing the best system for a workflow depends upon a lot more than what is available in a classroom. As a student, it's more important to learn the craft of editing, than how to run a particular system. I can't find any statistics to support your claim that Avid holds only 1% of the entire market, can you point me in the direction of where you read that? Oh puh-leeeze... spare me the straw man bs, won't you? I never said one word about "best" or "better" or anything even similar. So you're clearly grasping for straws. Especially since you (quite disingenuously) cleverly avoided nearly all of the ACTUAL subjects I spoke of. Gee... wonder why? So how does Avid make any economic sense? Learn it just because a few post-houses are using it NOW. Most of which I know of haven't even updated since v5. And yeah, the students were in fact TRAINED on the Avid as part of the course... oops, THAT'S why they don't use it. Sorry. They clearly have decided what works best for them, since... erm... why would they be using it otherwise?? Duh. And of the different NLEs they learn, Avid certainly isn't it. And yeah, they learn how to tell a story first and foremost (or " tell "the grammar of film")... imagine that. Only, as e.g. the CEO of the second largest Mexican broadcaster (filled with FCP X suites) put is perfectly: "Final Cut Pro X lets me organize my media the way I want to in the application and then **gets out of the way**. It feels as if Final Cut Pro X is designed for artists, while other editing systems **are for operators**." (emphasis mine)... BINGO. Now you know why the up and coming hate Avid. It's a tool of yesteryear still bent on showing off its buttons and complexity as their (very skewed) idea of "PRO" without the least bit of consideration to actual intuitive USABILITY. And don't give me the "you get used to it" or "once you learn it" baloney. With FCP X it is *logical* how you use it and incredibly *fast*, because, as the CEO observed perfectly, it *gets out of your way*. No superfluous patching of tracks, selecting edit modes yadda yadda yadda... you just EDIT. And I said that Avid (presumably) holds a large part OF 1% OF THE MARKET not the ENTIRE market (that's more like 15%... at best). Namely the (actual) film and broadcast market. Again, the "pro" market of YESTERYEAR. Avid has completely missed the boat on the pros of TODAY which outnumber those elitist depts. by an easy 20:1. And yes, that in fact includes the YouTube channel that is making more money a month that you and I in a year. Deal with it.